With ARCore and Google Lens, we're working to make smartphone cameras smarter. ARCore enables developers to build apps that can understand your environment and place objects and information in it. Google Lens uses your camera to help make sense of what you see, whether that's automatically creating contact information from a business card before you lose it, or soon being able to identify the breed of a cute dog you saw in the park. At Mobile World Congress, we're launching ARCore 1.0 along with new support for developers, and we're releasing updates for Lens and rolling it out to more people. ARCore, Google's augmented reality SDK for Android, is out of preview and launching as version 1.0. Developers can now publish AR apps to the Play Store, and it's a great time to start building. ARCore works on 100 million Android smartphones, and advanced AR capabilities are available on all of these devices. It works on 13 different models right now (Google's Pixel, Pixel XL, Pixel 2 and Pixel 2 XL; Samsung's Galaxy S8, S8+, Note8, S7 and S7 edge; LGE's V30 and V30+ (Android O only); ASUS's Zenfone AR; and OnePlus's OnePlus 5). And beyond those available today, we're partnering with many manufacturers to enable their upcoming devices this year, including Samsung, Huawei, LGE, Motorola, ASUS, Xiaomi, HMD/Nokia, ZTE, Sony Mobile, and Vivo. Making ARCore work on more devices is only part of the equation. We're bringing developers additional improvements and support to make their AR development process faster and easier. ARCore 1.0 features improved environmental understanding that enables users to place virtual assets on textured surfaces like posters, furniture, toy boxes, books, cans and more. Android Studio Beta now supports ARCore in the Emulator, so you can quickly test your app in a virtual environment right from your desktop. Everyone should get to experience augmented reality, so we're working to bring it to people everywhere, including China. We'll be supporting ARCore in China on partner devices sold there— starting with Huawei, Xiaomi and Samsung—to enable them to distribute AR apps through their app stores. 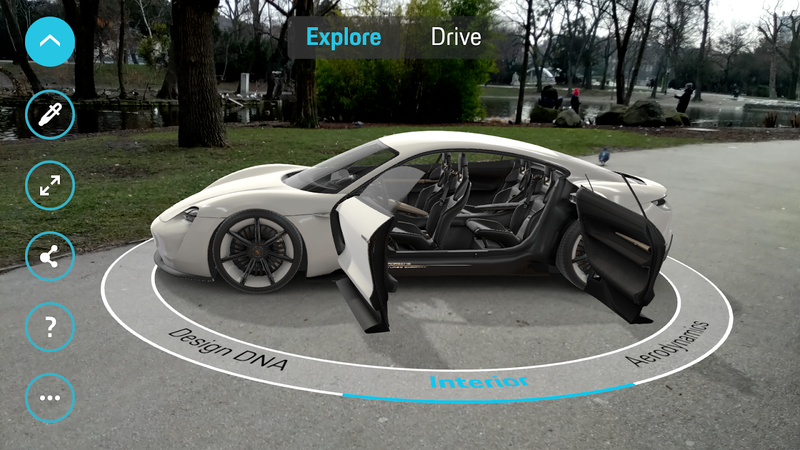 We've partnered with a few great developers to showcase how they're planning to use AR in their apps. Snapchat has created an immersive experience that invites you into a "portal"—in this case, FC Barcelona's legendary Camp Nou stadium. Visualize different room interiors inside your home with Sotheby's International Realty. See Porsche's Mission E Concept vehicle right in your driveway, and explore how it works. With OTTO AR, choose pieces from an exclusive set of furniture and place them, true to scale, in a room. Ghostbusters World, based on the film franchise, is coming soon. In China, place furniture and over 100,000 other pieces with Easyhome Homestyler, see items and place them in your home when you shop on JD.com, or play games from NetEase, Wargaming and Game Insight. With Google Lens, your phone's camera can help you understand the world around you, and, we're expanding availability of the Google Lens preview. With Lens in Google Photos, when you take a picture, you can get more information about what's in your photo. In the coming weeks, Lens will be available to all Google Photos English-language users who have the latest version of the app on Android and iOS. Also over the coming weeks, English-language users on compatible flagship devices will get the camera-based Lens experience within the Google Assistant. We'll add support for more devices over time. And while it's still a preview, we've continued to make improvements to Google Lens. Since launch, we've added text selection features, the ability to create contacts and events from a photo in one tap, and—in the coming weeks—improved support for recognizing common animals and plants, like different dog breeds and flowers. Smarter cameras will enable our smartphones to do more. With ARCore 1.0, developers can start building delightful and helpful AR experiences for them right now. And Lens, powered by AI and computer vision, makes it easier to search and take action on what you see. As these technologies continue to grow, we'll see more ways that they can help people have fun and get more done on their phones.